When deciding on a route forward for your 3D project there are many elements that need to be discussed when considering an automated vs a manual solution, however, cost should not be top of the list; here’s why. The outlay to own, manage and fulfil these tasks as a business investment are significant, however, outsourcing this work to experts in the field is a very cost effective method of managing your batch inspection projects. On top of this, you have the reassurance that the task is being handled by professionals with vast experience of using the latest equipment to complete the project to the highest standard in very short lead times. What is automated 3D scanning? Automated 3D scanning is taking the process of capturing highly accurate point cloud data from an operator influenced measurement process to a robot controlled process; the key consideration here is ‘influenced’ vs ‘controlled’. 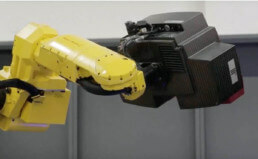 Using an automated approach we are able to remove process uncertainties like operator driven measurement positions, number of measurements taken and data capture variation but also add assurances such as optimal measurement positions based on features (important for aerofoil trailing edge and sheet metal measurements). Automated 3D scanning is repeatable, fast and traceable with the added advantage of being more accurate than manual scanning. The 3D data from a controlled automated process is the most stable and accurate method for 3D surface measurement and is driven towards batch inspection and quality control, including comprehensive GD&T. Additionally, through the measurement of multiple parts we are able to achieve a detailed understanding of process capability; PPK and CPK. 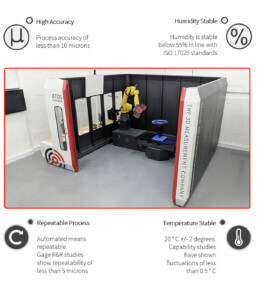 Here at T3DMC we house the UK’s largest open source automated optical 3D measurement machine capable of measuring parts 3m in diameter and 2 tonne in weight. This is all housed in our temperature stable measurement room which is a critical feature to increase process stability. Temperature and humidity are recorded for all parts which gives full traceability and a clearer understanding of part process capability as we completely understand the variations during the measurement process. So, is automated 3D scanning expensive? With the level of technical requirements including hardware, software, measurement environment and engineer experience there is a growing understanding that the process of integrated automated scanning and inspection into your own production process is inherently very expensive. However, with per part costs as little as £50 + VAT, outsourcing is an excellent and genuinely cost effective route to achieving comprehensive batch 3D scan inspection reports. Once the initial set up and programming are complete, the system is capable of running without any intervention other than part changeover and re-start and as the system records each part individually, full traceability is always maintained. We work with a number of repeat customers whose costs are now limited to just the scan cost for each part. We create customised templates containing full measurement and inspection programmes so the customer simply informs us of the next batch of parts to be inspected. From there our team arrange collection, load the appropriate programme, assemble fixtures (where necessary) and then run through their batch of parts before sending them back with the inspection results in PDF format. We have a bespoke project management software (Pathway) which enables us to efficiently manage our scanning projects in the most effective way and we keep our customers updated with progress reports every step of the process. It’s quick, efficient and cost effective if you are considering short to medium term projects or when you have frequently changing programs. How do you access affordable automated 3D scanning services? 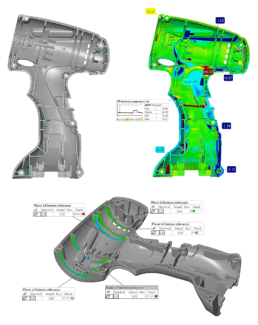 The 3D Measurement Company have been established since 2013 and have a team of experts in programming and running large volumes of parts on automated 3D scanning systems. The team at T3DMC have over 20 years of relevant industry experience and specialise in all aspects of the measurement process from part preparation, measurement reference frame design and production, programming and complex inspection. We design programmes and workflows in an offline virtual environment before we receive the real customer part. This results in a vastly reduced contact time when the parts are with us so that we do not impact on your own lead times. Our experience and expertise makes the process very simple and easy to follow for our customers. The best way to find out how you can make our automated solutions work for you, is to get in touch and discuss your application with our team of experts. If you are interested in exploring the possibilities of using the largest open source automated 3D scanning system in the UK without spending a lot of money to do so, please get in touch with us and we will help advise on the best 3D scanning solution to meet your budget needs. Give us a call on 01746 762251 or drop us a note on info@t3dmc.com. Here at The 3D Measurement Company (T3DMC), we’re always looking to improve how we work so we can continue to add value to our customers with their 3D projects. The latest improvement we’ve invested in comes in the form of a new systems software we call “Pathway”.